The shaper is one of the most versatile and important devices used in production and maintenance centers. It is an important production machine along with milling and lathe machines. The primary role of this tool is to produce surfaces that are at different planes. The equipment contains powerful motor that develops the rotary motion. This motion is the changed to reciprocating movement . The reciprocating feed is then connected to the cutting tool such that the cutter moves forward and backwards. During the forward stroke, the specially shaped cutter makes an incision along the workspaces but does not cut on the backstroke. Vertical feed is provided automatically so that the groove made by the cutter continuously deepens to the required depth. During the backward stroke, the vertical position of the cutter changes so that it removes some material during next cycle. The vertical feed and cutting speed are adjusted to match the type of metal, depth of cut and type of operation. Gears are an important constituent in vehicles, machines and other parts. The main types include: bevel, spur, helical and worm gears. The main methods used to manufacture different types of gears include: hobbing, milling, shaping, broaching and grinding. This shaping process has been used for a long time to manufacture them. The blank or a round work piece is mounted on the equipment table. The tool resembling the tooth to be cut is mounted on the tool clamp on the device. The reciprocating motion of the tool forms a single tooth on the round work piece. Once completed, the blank is rotated using an indexing head. The indexing head is set such that it accurately rotates the blank to a position where the next tooth will be formed. This process is used in manufacturing both internal and external components. Shaping machine and broaching are very much similar and are used on very large work pieces that require extra force to manufacture. For manufacturing plants that require high production runs, cutting of one piece at a time is not convenient. In this case, pinion shaped cutters are used. They are mounted on the shaper while the blank is clamped on the equipment table. As the cutter moves forward and backwards, the whole gear is formed in a single operation. In addition, this equipment is also widely used to form keyhole, slots and internal splines that fasten pulleys on the shaft. 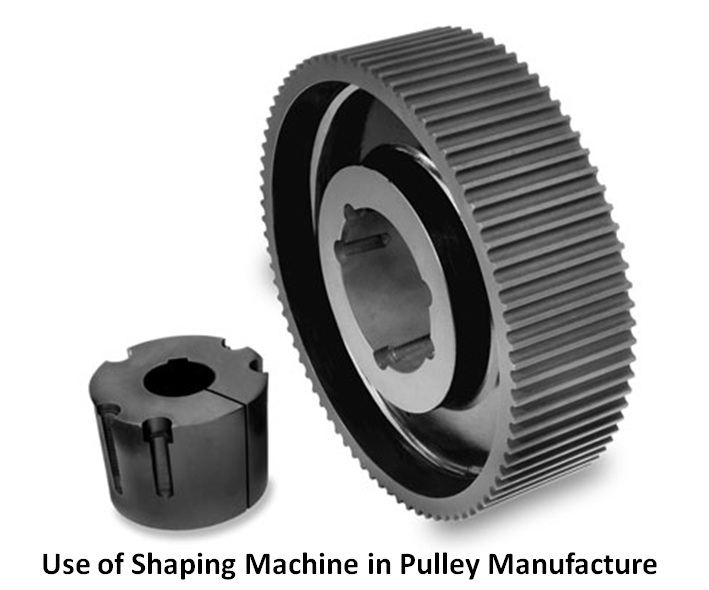 Pulleys are used in many industries to transfer rotary motion between different components. The increase or decrease speed depending on the ratio of the diameter of the driver and driven wheels. The shaper is used to produce internal slots and keyways which are used to assemble the pulley wheel on the shaft. The slot is made on the internal radius of the pulley using this device. Therefore, the shaper plays a fundamental role in the development of rotary components. This entry was posted in Shaping Machine by Yash Shah. Bookmark the permalink.